Above you will see a photo of an install of one of Signature Iron Doors' creations. 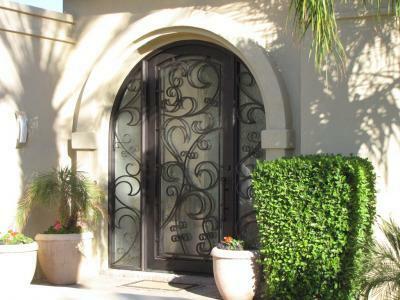 This unique full arch iron door has integrated sidelights and brings this entryway to life. The scroll work is hand forged by fire, creating a one of a kind piece of artwork and overall striking impression. Residents of San Jose are in the heart of Silicon Valley surrounded by technology and innovation. Though our iron doors may not open themselves or talk to you, they will last forever and are made from recyclable materials. They are fully insulated with polyeurethane foam insulation and dual panned insulated glass panels, making them energy efficient and require minimal maintenance. Lets not forget the overall beauty and unique craftsmanship that will leave your neighbors filled with envy. Signature Iron Doors proudly provides outstandingly quality iron products matched with fantastic customer service. We invite you to take a look at our website and contact us to see how we can help you with any of your iron needs.